If you are still considering what electric scooter to get – this is one worth considering. An electric scooter opens up doors for many individuals, as they can be used as a mean of transportation when going to work, down to the store or when going out to meet a friend. They are also fun for young riders who are still not old enough for a driver’s license, but who are responsible enough to use a scooter. This is a powerful scooter with an extra-large deck frame and a surprisingly quiet chain-drive motor so that you can move around both safely and discretely on most types of roads. It charges fast, goes far on one single charge and has a variable speed for safety and comfort. It is an electric scooter suitable for riders aged 12 and older, it comes with a charger and everything you need to get out there right away. With a top speed of 15 mph – a higher speed than many similar models are capable of – this is an electric scooter that is unlikely to let anyone down. It is one of the fastest Razer scooters available on the market! It has its powerful and chain-driven motor to thank for this feature, and users quickly notice that it is just the right speed to get you comfortably (and safely) to where you need to go. You have the option to drive it slower as well, and there is no need to go up to maximum speed unless you feel comfortable with it. The deck-frame is extra wide on this product, which accommodates large and sturdy 10-inch pneumatic tires. Big wheels and thick tires are great for driving on uneven roads, when passing over small rocks or twigs when driving while wet outside and much more, and it is generally safer for an electric scooter to have thick wheels. A wider deck-frame also gives the rider more space to stand on; improving balance and overall comfort, and the anti-slip surface makes sure that you never have to worry about slipping and sliding around while driving. The twist-grip throttle is easy to manage, the handles on the handlebar are easy and comfortable to hold onto even during long drives and it is an electric bike that can be used by both teenagers, adults and elderly individuals. This means that this product can be used by the whole family and enjoyed together, which might make the purchase a bit more motivating. The initial charge will take 12 hours, and it is recommended that you don’t leave it charging for more than 24 consecutive hours. The charging time, in general, can be up to 12 hours, which may seem long in comparison to some other products, but this electric scooter can drive for up to 45 minutes without needing a recharge, which places it well ahead of many similar scooter products out today. It is best to always charge it fully before getting back on it, to avoid wasting the rechargeable battery (included in the purchase) as it might shorten its life. This is the case with batteries in general and is not specific to this product. The 45-minute riding time can vary somewhat depending on weather conditions, road conditions and more. The scooter is sturdy yet lightweight (52lbs) enough to be managed by most individuals, and it is great for roaming around the block, for an outing where lots of walking would otherwise be needed, for commuting the city to work and much more. Children should always wear a helmet when riding since these scooters can pick up quite a lot of speed. The Razor E325 is a great electric scooter for adult riders and for children over 12. The impressive top speed (15mph) makes it unsuitable for younger children, but this is of course at the discretion of the parents. 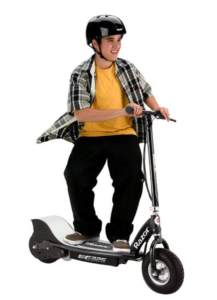 Before letting a child use the scooter, it should be established that he or she has the maturity to manage such a potent scooter, and a helmet should always be used for safety reasons. A child should know how to control the speed, how to break and how to safely navigate on roads before being allowed to use it, and any child under the age of 12 should be supervised at all times. It is, however, an excellent mean of transportation for a teenager or young adult who may still be too young to drive a car, as it gives them independence and a sense of responsibility; as they might be able to go places without having to ask an adult for a ride. 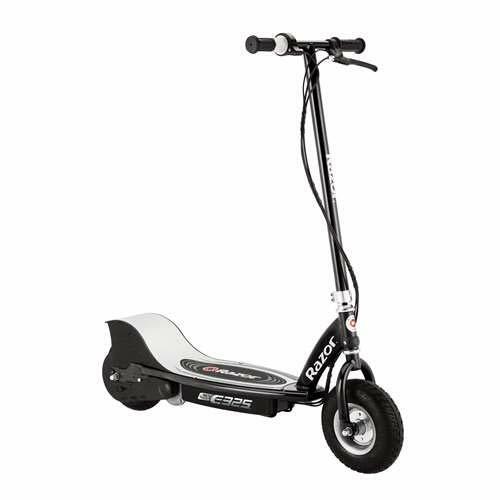 This is also a great electric scooter for adults that are looking for an alternative way to get to work, for going out to see friends or as a method to sightsee around the city. It holds for most normal-weight adults, has a satisfactory speed which will take you where you need to go without wasting time, and the handlebar can be raised to fit taller individuals. For those who normally commute short distance, this could be a great way to get some fresh air before and after work, or if the commute is longer then you can use it to get to the bus stop! Or hey, why not skip your normal bus stop and drive it to the next one, just for fun? The scooter is perfect for anyone who wants some transportation help without having to pull out the car, as can save both time and effort, while also keeping nature a little bit happier. In the world of today, environmentally friendly transportation options are important, and every small effort makes a difference. The Razor E325 can also be used by elderly individuals who wish to regain some independence, or who might be losing some of their mobility which could make it harder to walk long-distance. A good scooter such as this one can take an elderly family member down to the store, along for a Sunday stroll that they might otherwise have to say no to, it can make it possible for them to get to a dentist appointment without help and much more. This scooter does, however, require a bit of balance from its rider, so it is important that whoever uses it is agile enough to stand up while driving and to get on and off without the risk of injury. Since the electric scooter made its appearance, the market has exploded with options and varieties. This is a nice all-around scooter that speaks to the active user who wants it for transport since the speed makes it perfect for getting from one place to another within a short period of time. It is a long-distance scooter that works well for commuting since it can drive for 45 whole minutes without needing a recharge. Keep in mind though that you might not have time to charge it fully while at work, so if you work far from home you might have to consider taking the bus back. 45 minutes is; however, a lot longer than most similar scooters are able to drive on a single charge, and this product has its powerful engine to thank for that. The handles are very grip-friendly and slip-proof, just like the surface you stand on while driving. This adds both safety and comfort, especially on days when the weather conditions aren’t ideal. Rain and moderate wind are no issues here, and the rider will stand securely on the scooter during the whole ride. While some scooters, both electric and regular, tend to have a very slim deck to stand on – this variety has an extra wide deck that adds balance and ease to the ride. It is built to fit a variety of individuals, and you can easily stand with your feet together and still have plenty of space left on the sides. Some older models would have you stand with one foot in front of the other, but this is now a thing of the past. 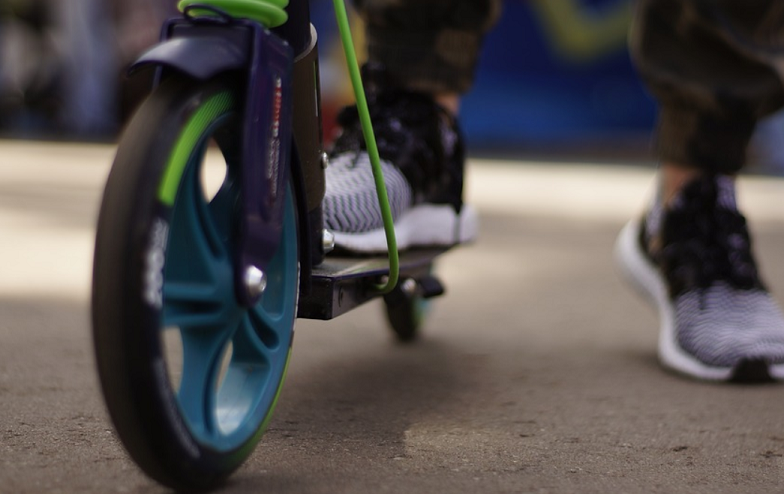 The Razor E325 is a great electric scooter that appeals to adults, teenagers, and even kids. While it might not be suitable for the youngest admirers due to going up to 15mph, it is a fantastic asset for older children those older that wish to transport themselves somewhere without having to drive or ask for a ride. It is an environmentally friendly option thanks to the rechargeable battery, and it is a way for the average citizen to make a change in their everyday life that could contribute to a more sustainable planet for future generations. As an extra plus, this electric scooter is both stylish looking and heavy duty, lightweight enough to be carried onboard the bus or the train when commuting longer distances.